Journaling a sentence each day for a month makes for a reflective blog post. I joined this challenge in June and have sincerely enjoyed keeping track of my daily adventures. I always look forward to July. It sits nicely right in the middle of the year and the summer. There always seems to be so much hope for July, with vacations, a one-month buffer in either direction from school obligations, and a few birthdays to celebrate. July 1 Saturday. I spent a leisurely morning taking a Pilates class, packing for a weekend at the delta (speaking of the delta, read my post from June 30th). Drove the 65 minutes while enjoying an audio book. Caught up with hubby on the freeway! July 2 Sunday. At the delta this weekend, everyone got their wishes. 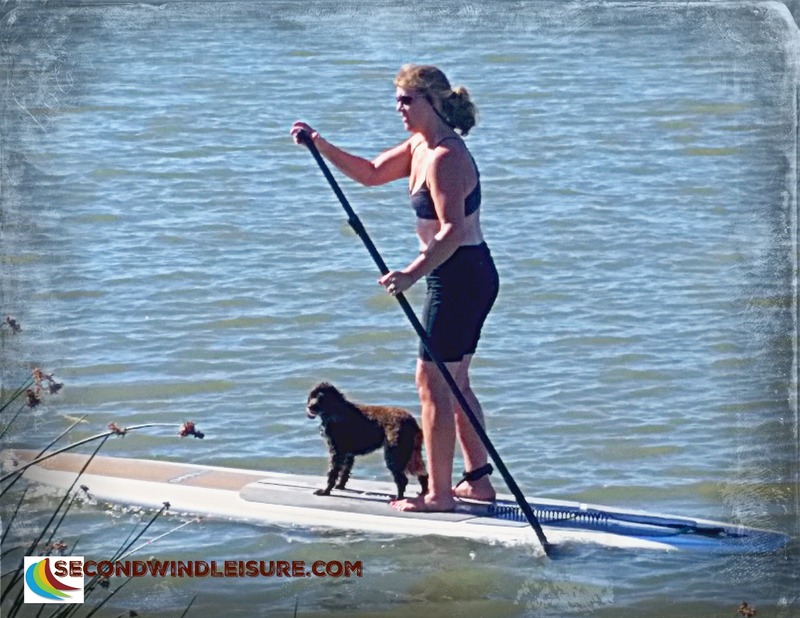 There was enough wind for some sailing later in the day, with a light breeze and a decent tide in the early afternoon for those who love to stand-up paddle (SUP)–me! Everyone was in party mode this evening! July 3 Monday. Hoped to windsurf today but the wind died in the morning. We missed the narrow window. Hubby got to sail, and I let Brodie run among the waves and chase the wind and water. We drove back home in the afternoon, thinking hubby had to work on July 4th, but he got a call from his boss that he didn’t have to work after all! July 4 Tuesday. Independence Day! Happy 241st birthday, America! Had an unexpected breakfast with my daughter and her boyfriend who drove in late last night. When they left I went shopping at the outlet stores to pick up some key wardrobe pieces for the Fall semester. Hubby did some painting and touched up the walls in the guest room. He put some yummy eats on the grill. Nice to be home in the air-conditioned house and not out in the heat with all the crowds. July 6 Thursday. My journal app prompted me to write something for which I am thankful. I am grateful for new blogging friends and old ones. How apropos to write this on the day I shared my first Sentence A Day post. Through the link, I met new bloggers and enjoyed reading about the busy lives of other writers. And I’m feeling so blessed right now I won’t even complain about the lousy water aerobics class I attended today! July 7 Friday. Scorching hot day, walked the dogs early. Normally I go to yoga but I wasn’t feeling it today. I went to the gym and used the elliptical and read my Kindle. My brother and family came by for about an hour on their way back home to San Diego. July 8 Saturday. Woke up at 4:00am to drive hubby to the airport this morning to attend his older brother’s 60th birthday in Washington state. I did get back in time to capture this amazing sunrise (above) that perfectly coincided with the Summer Instagram Challenge I am doing for July. I stayed home since our pup is too rambunctious to leave in the care of anyone just yet. Later in the morning, I presented on “wise use of images for blogs and websites” at the Sacramento Bloggers meet-up. 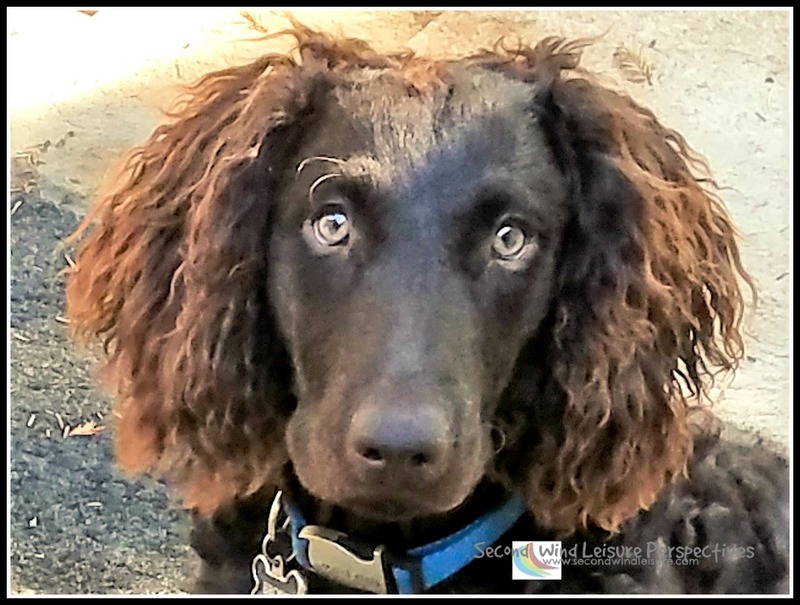 Read more about my harrowing experience here: Dog Days of Summer: Recognizing Canine Parvo-Virus. July 10 Monday. 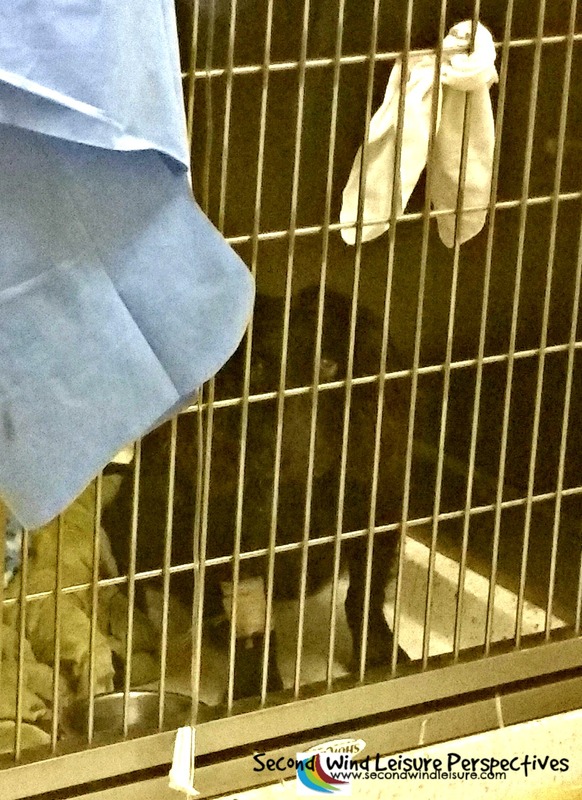 Brodie spent the first of at least three nights in isolation at the animal hospital. They let me visit him, but I had to stay behind the windows. He’s the only dog in isolation but there is someone there 24/7. When I saw him, he sat up and visibly brightened. I dropped off a handkerchief with my scent on it to put with him in his kennel. Having some faith and getting through the day, I still attended a WordPress meet-up this evening to get some help for a the Above-time blog for which I freelance, then off to pick up hubby from the airport. When we stopped for dinner on the way home, I dropped the bomb about the estimate for treatment and care. POW! July 11 Tuesday. 7-11 means free slurpies from 7-11 stores. The line was too long. The vet called me at 10am to tell me that Brodie is doing so well, he may be released this evening! This saves me a huge amount of money, not to mention my excess worrying. I’m so relieved. The Lord is good! July 12 Wednesday. I seem to be suffering from lack of sleep. I wonder why? I woke up late, did some blog and website admin, then finally went to the gym. Brodie slept a lot, didn’t eat much, but continues to grow stronger. He is taking a series of medications around the clock. I’m lucky I can be home all summer to take care of his needs. I got back to the writing of my fitness book which included some research today. July 13 Thursday. A normal Thursday with bootcamp class, Weight Watchers meeting, and errands. Managed to write 2000 words in the book today. July 14 Friday. 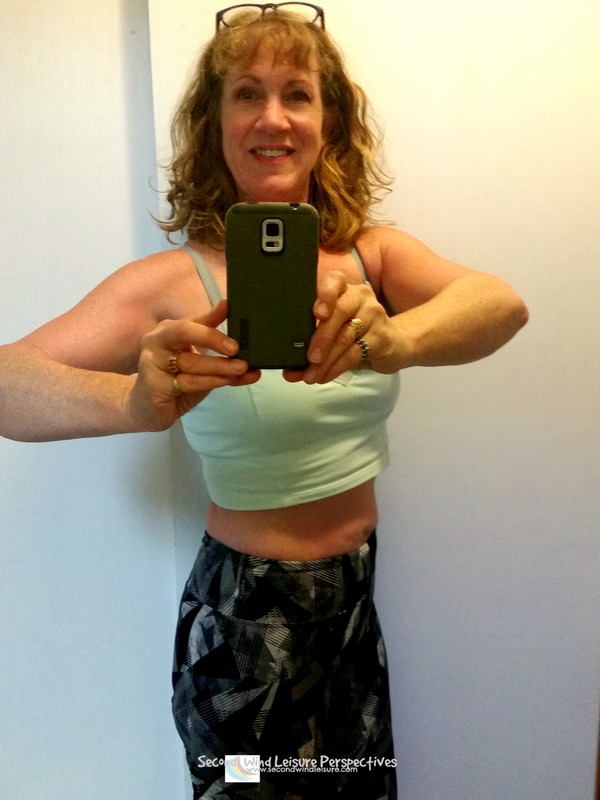 After losing 30 pounds with Weight Watchers and not being at this new weight since my 30s, I still see pudge, curves, loose skin and other pesky visual issues. July 15 Saturday. Today marks my dad’s 81st birthday! I walked the dogs early due to another round of heat. This was Brodie’s first walk since he recovered from the parvo scare. No delta this weekend due to the heat. 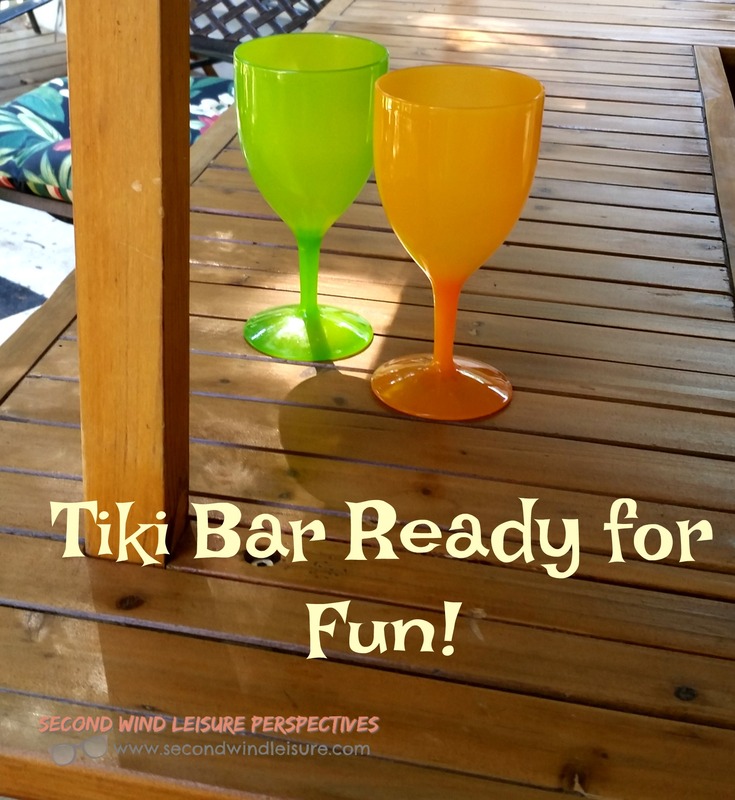 We decided earlier in the week to have a little get together with hubby’s friends to break in our new tiki bar out on our backyard deck! Can’t beat homemade mai-tais! July 16 Sunday. Spent a lazy morning with our houseguests who spent the night from the party the night before. Happy the mai-tais were kind to us the next day. July 17 Monday. Spent the morning with hubby (he has Mondays off all summer) enjoying coffee and some morning yard work. 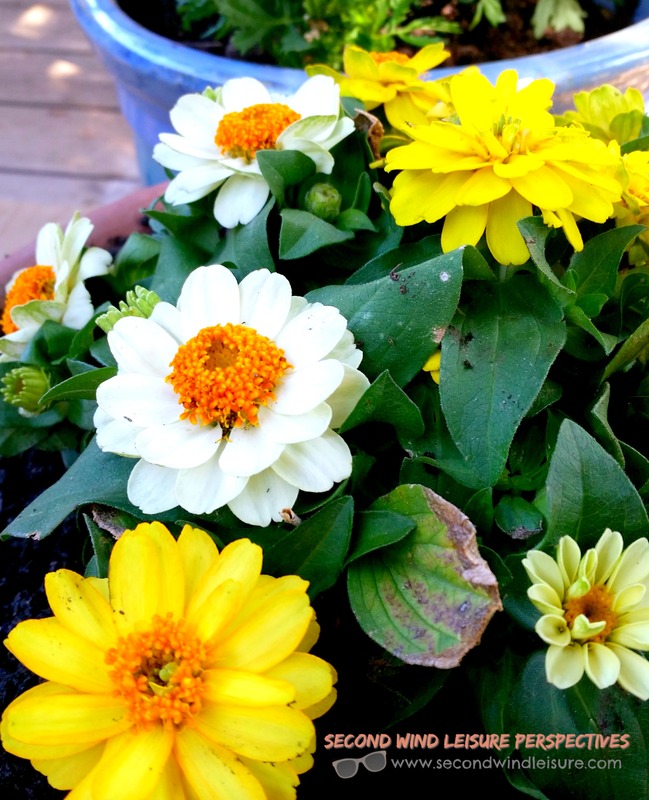 I potted some flowers for the backyard deck. I did my usual gym routine with some reading. Hubby ran errands while I spent three hours writing in the book using my new stand-up desk!! July 18 Tuesday. Brodie has been home a week and is eating to make up for those lost meals. Everything is back to normal there and I am grateful to friends, family and FaceBook peeps for their prayers and support. We took a morning walk in the much cooler air. More writing on the book today. I have 6 weeks before I start back to teaching, so I must be diligent! Hubby went windsurfing after work this afternoon. I’m happy when he gets his sailing session in. Happy wife, happy life…something like that! July 19 Wednesday. I almost want to just write a “wordless Wednesday” sentence for today, so little motivation. 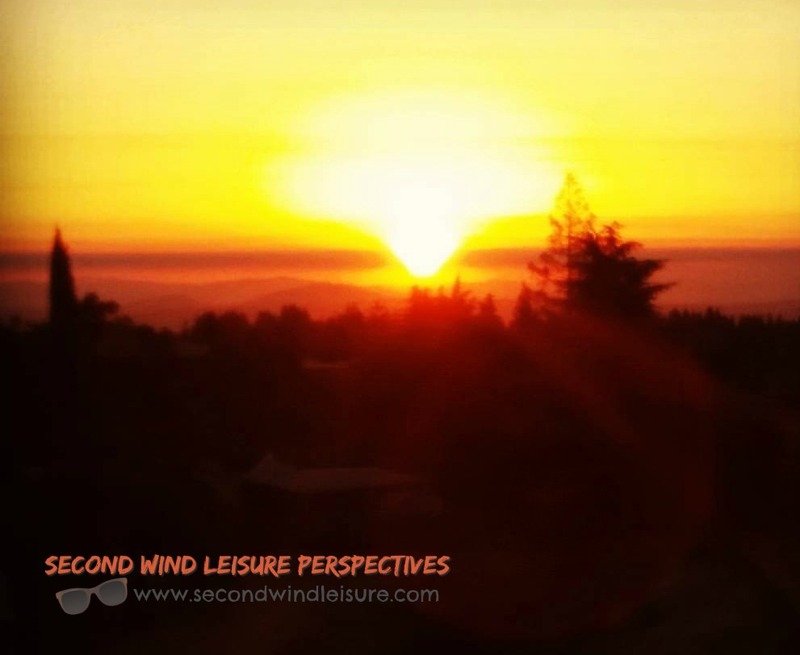 But, I spent quite a bit of time on the blog today, getting two posts ready for the week. 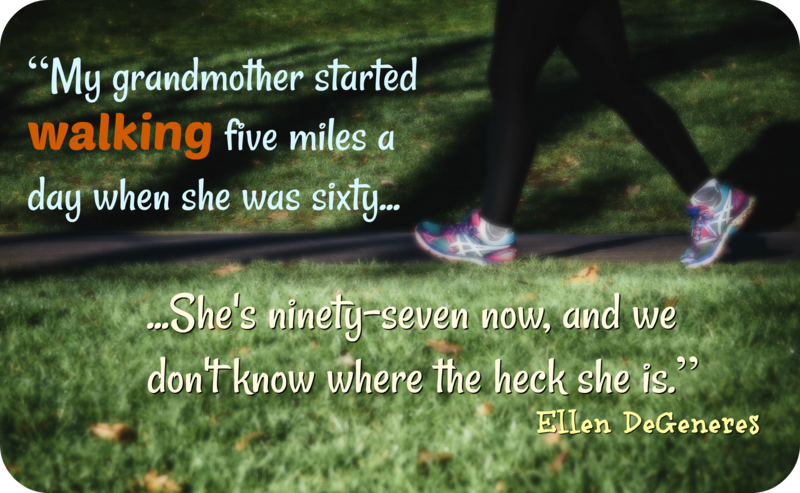 I wrote one about the benefits of walking using a funny quote by Ellen DeGeneres. I am building my email subscriber list as I write my book No Excuses Fitness. If you are interested, please CLICK HERE. July 20 Thursday. Rather than my usual “spa day” Thursday, since my touchy knee was acting up, I decided to go for a one-hour bike ride before it got too hot. I blew off my weight watchers meeting and settled in to write and take care of blog comments. The rest of the day was just…meh. July 21 Friday. At my early morning yoga class, each time I practice, I feel stronger and more flexible. Took the pups for our early morning walk before the 100-plus temps hit. I finished a series of audio-books and entered them into my GoodReads progress. July 22 Saturday. I don’t know what I ate the day before, but I had serious intestinal pain all night and into the morning. I lay in bed a little longer, leaving the bedroom door open to the backyard deck. Within 15 minutes of Brodie running in and out, on his next pass he brought in gobs of wet mud! The floor, bedspread, hall closet and floors were covered! As far as I knew our backyard has no mud. Apparently, the adjoining neighbor let her water run too long and it pooled into my backyard creating a sizable mud hole in which Brodie couldn’t resist! After all that hoopla, cleanup and feeling better I made a quick gym run before I packed for a weekend at the delta. Hard to believe we haven’t been there since July 3rd! It’s supposed to be hot again, but we need to be there. July 23 Sunday. Our Sunday morning at the delta started out quite warm. I finally got an hour-long SUP session. It can be dismally hot when there is no wind and no access to A/C, and you can’t just wallow in the water all day. Sitting around in a wet rash-guard and shorts gave me some relief. Then miraculously the wind suddenly came up in the evening! I got in a wonderful and unexpected windsurfing session! July 24 Monday. It is refreshingly quiet on Monday mornings at the delta. The campground can be noisy and buzzing when everyone is there all weekend. Hubby got his windsurf session in, and I packed and headed home. I actually made it to the gym, got a brainstorm for my book, then added 800 inspired words to it! July 25 Tuesday. Another early morning walk with the pups. This is becoming a habit, which I enjoy! I have errands to run including exchanging Brodie’s now too small life-jacket (luckily he never wore it) for a larger one. I also had to shop for a new cell phone and scored one of the last of the Galaxy S7 Edges. July 26 Wednesday. I rarely get bike rides on Wednesdays. Once school starts in late August, Wednesday will be my long day on campus. I took some photos with the new Edge (what a camera!) My bike ride was pleasant and probably the last one for a few days considering we are facing 10 plus days in a row of 100+ temps again. I’m melting! July 28 Friday. Went to early yoga, took dogs for a short walk! My oldest daughter is here visiting for the weekend. She ran some errands with me and we grabbed some easy food from Costco for dinner. July 29 Saturday. No packing for the delta this weekend, yay! As much as I enjoy camping there, I love a change of scenery. Instead, I got things ready to go to Tahoe City, on the west shore of Lake Tahoe to stay at a friend’s cabin through Monday. Got there Saturday and ate a late dinner at a nice bar and grill. Sure is nice and cool up here! July 30 Sunday. So very nice to wake up in Lake Tahoe. We have private beach access (as do a large number of neighbors). It was very pleasant letting the dogs swim. Got a great photo of our friend’s dog leaping off the pier after the ball! July 31 Monday. Drove home from Lake Tahoe. There was a ton of traffic, odd for a Monday. This last day of July came with a wonderful surprise! 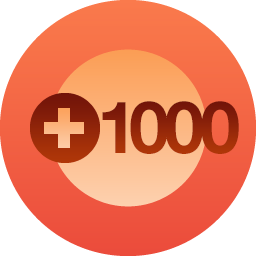 I officially have 1000 followers to my blog. Thank you to all who follow, read, like, comment and share! I am eternally grateful for your blogging friendship! So ends a strange July and thank you for reading! How was yours? Do tell in the comments! Interested in being part of A Sentence A Day? Please visit Leslie at her blog Once Upon A Time & Happily Ever After. I have met some new bloggers and have enjoyed this challenge. 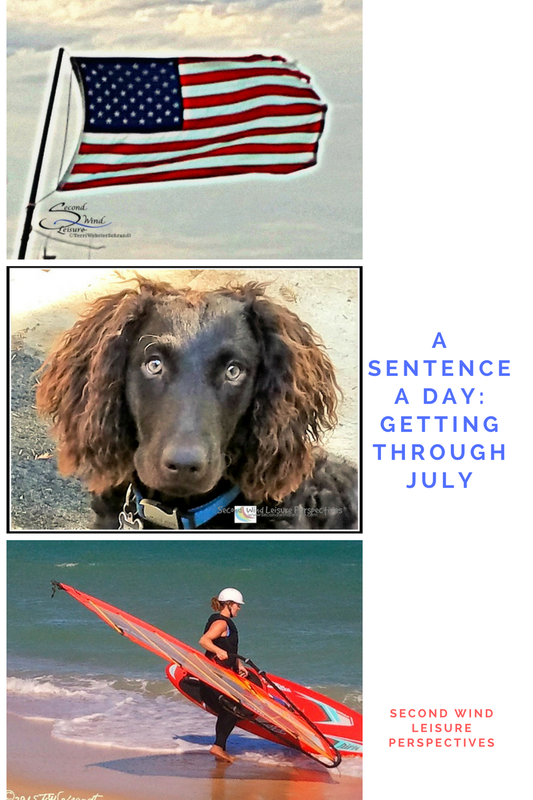 Please visit the link-up for more Sentence a Day posts. You definitely had a full month! I’m glad that Brodie recovered quickly and that you were around. Great job on the weight loss! You look fabulous in that cropped top! I love all the yoga you are doing. I’m back to taking regular barre classes and feel so much better. I hope you are having a great August so far! I would never post my journal – you are brave. And you have a wonderful figure. Of course, you live a healthy lifestyle. And then there’s the dogs – yes for dogs. Lots of good stuff going on for you. Congrats on the 1000 that is awesome. Your weight loss is amazing, well done you look great. What a month you have had, Terri! I am so glad that Brodie is better now, I know how worried and upset you must have been. Congratulations on 1,000 followers. Quite a milestone. Well done. So glad Brodie survived Parvo and is eating and thriving again. And that you were able to bring him home early to cut down the vet bill. 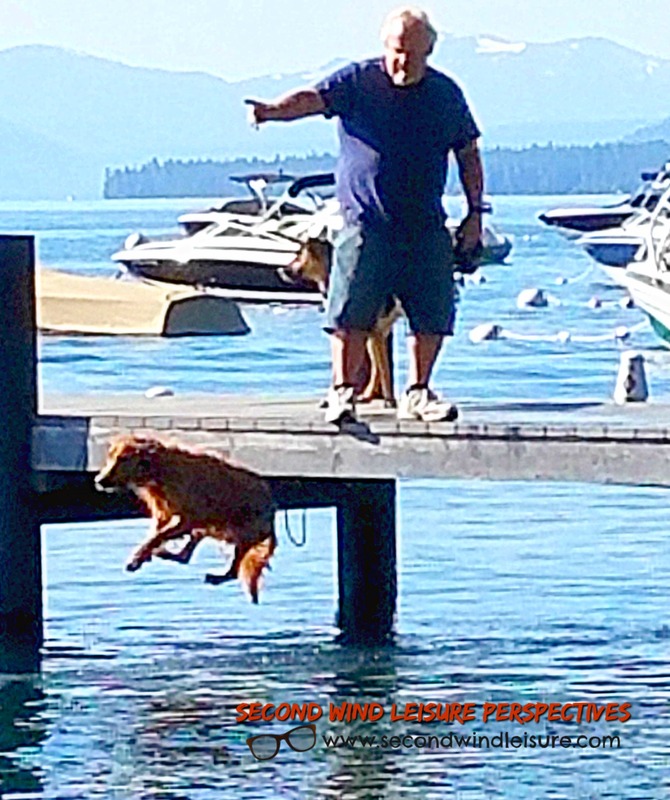 Love the picture of your neighbor’s dog jumping off the dock. Looks almost like a painting. I really need to learn more about using my camera. Right now just focusing is a trick for me. Bravo on the weight loss. I truly believe WW is the best way to lose and maintain weight…I say when I am heavier than I have been in years. Since WWs in 2010. I need to get back at it. Really only want to lose 10 pounds but would feel so much better with those ten pounds off. Maybe I could wear a midriff work out top, too. You look sensational. We have been biking to the gym on Sundays. We knock out the cardio on the bike ride then do a good work out with weights, lay on the hydro massage bed and ride back home. Sure glad you have joined up for Sentence a Day. Rockin the crop top!!! You’re a very busy person. I’ve kept a food and exercise journal on an off for many years. When I let my journal drop by the wayside I always gain weight. As soon as I pick it back up again the pounds drop off. (imagine what it would be like if I was consistent, maybe I could rock a crop top too.) I also add some of the day-to-day things I do to this journal. I’ve reread several of them and sometimes wonder how I got through some of the tough stuff. I am happy your puppy is feeling better and you are enjoying your leisure time. I read your more recent blog Photographing the Textures…beautiful pictures. I hope your wrist is on the mend and you will be back at the water sports soon. Sounds like you had a great month, Terri, except for Brodie’s time in the hospital but that turned out okay in the end. You are looking absolutely fabulous. Well done. I can only imagine how worried you must have been about your dog – they’re such a special part of the family. As an aside, you’re rocking that midriff top – congratulations on the weight loss. Congratulations, Terri, on your weight loss – you looks stunning! Enjoyed reading your Sentence a Day post, Terri. So glad that Brodie is o.k. It’s so scary when our pets are sick! Congratulations on the milestone for your blog and how happy you must be that your dog survived all that – phew. And by the way, you look amazing in that crop top. Thank you so very much, Jan! Wow! 1000 followers is an amazing achievement, Terri, and you have worked hard to get to this level. What an active life you lead! So happy Brodie is well enough to track mud through your house. And I’m very impressed with the bare midriff. I also love the month of July as it seems to be the purest of all summer months with no hint of late spring or early fall contaminating it. Molly, even your comments are funny! You are so right about July–pure is the perfect description!! This July, excessive heat contaminated it really good. Congratulations on the 1000 followers and the weight loss, Terri. That shot of you is fabulous, by the way. I did use the word “fabulous” on purpose! Looks like a great mix in July, of leisure and other activities. Sorry about the heat, and of what you and Brodie had to go through, of course. Happy August!! I enjoy reading your July recap, Terri. You look fit and I know it’s ongoing hard work to stay fit. Wishing you a speedy recovery of your right hand. Thank you, Natalie! Turns out my hand is fractured! At least I can move my fingers w/o pain. Sigh! Terri, this post is such an inspiration in so many ways! I love the idea of writing a little each day, you did an awesome job with it! I’m so glad Brodie’s doing better, and you look amazing! Good for you! I usually keep a journal while I’m traveling, but now I’m thinking I should do the same every day. Now that I’m retired, sometimes it’s easy to lose track of the day-to-day occurrences. Congrats on the weight loss! You look terrific! Terri, it was interesting to me how you fit in exercise into your daily/weekly activities. This is something i struggle with, having never had any type of exercise program ever. I have a weekly hike (4 miles) and a weekly Zumba, but my 2x/week yoga seems to have disappeared this past month due to other things. I’ll need to figure out how to re-add that in. I love how you just do it. I also do journal (almost) every day – not the sentence a day, but a 1-2 pages a day. It started out as 3 pages a day – from Julia Cameron’s book The Artist Way (awesome book BTW), but I have small penmanship so am happy with the 1-2 pages. Never thought to blog about it, but do find it is super helpful in personal motivation, working through issues (talking to myself), and even just emotional monitoring. I loved this real glimpse into your life. Thanks for sharing…I got some great ideas for me to look into. Aww thanks, Pat! If you decide to join the challenge, PM me through my contact page and I can share the blogger’s email who is coordinating this challenge. So, for all that exercise I do, guess what happened? I fell down, walking my dogs yesterday and may have broken my right hand! Doc appt this morning for x-ray. Hope it’s just badly sprained. I couldn’t even type yesterday. I appreciate your kind comment!! It’s so fun to see what your month was like, Terri!! And can I just say that you look magnificent in that cropped top!! All of your activity has totally paid off and you should be so proud!!! thanks, Jodie…I’m just now reading yours and will leave a comment!